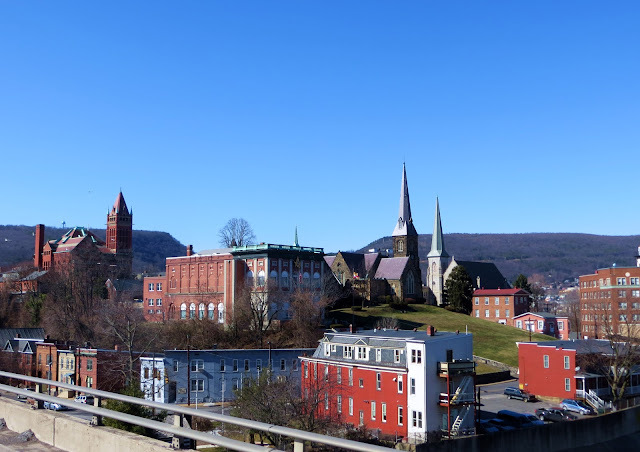 Here's another photo of Western Maryland - this is the town of Cumberland, as seen from the window of a moving truck on Interstate-68. I love when I'm not driving because I get to peer down into the town, and every single time I say, "I want to visit this place someday." Cumberland is named after the son of King George II, Prince William, the Duke of Cumberland. It is built on the site of the old Fort Cumberland, the starting point for British General Edward Braddock's ill-fated attack on the French stronghold of Fort Duquesne (located on the site of present-day Pittsburgh) during the French and Indian War. Cumberland was also an outpost of Colonel George Washington during the French and Indian War and his first military headquarters was built here. Washington later returned to Cumberland as President in 1794 to review troops that had been assembled to thwart the Whiskey Rebellion. Cumberland was a key road, railroad and canal junction - Baltimore and Ohio Railroad (B&O) and Chesapeake and Ohio Canal (C&O) - during the 19th century and the surrounding hillsides provided coal, iron ore, and timber that helped supply the industrial revolution. In addition, the city was a major manufacturing center, with industries in glass, breweries, fabrics, and tinplate. At one time it was the second largest city in Maryland - second to the port city of Baltimore — hence its nickname "The Queen City". It's got some great history, wonderful architecture, and from the photos I've seen, a quaint little downtown. And it's gorgeous in the fall - the burst of color as you come over the hill and around the bend is fantastic - I've seen it from my windshield many times. Fall - the perfect time to visit a city in the mountains. Beautiful photo. Cumberland passes in a flash; glad you captured it for us. Did you and Ed catch any of the "snowquester"? Glad that you are getting your winter-fix. Four seasons is good. That pic is so cozy and picturesqe..nice job..